Alan and Pina have lived contentedly in isolated - and insular - Boney Point for thirty years. Now they are dealing with Alan's devastating early-onset Alzheimer's diagnosis. As he is cast adrift in the depths of his own mind, Pina is left to face the consequences alone, until the arrival of a flock of black cockatoos seems to tie him, somehow, to the present. Nearby, conservation biologist Arianna Brandt is involved in a project trying reintroduce the threatened glossy black cockatoos into the wilds of Murrungowar National Park. Alone in the haunted bush, and with her birds failing to thrive, Arianna's personal demons start to overwhelm her and risk undoing everything. At first, when the two women's paths cross, they appear at loggerheads but - in many ways - they are invested in the same outcome but for different reasons. Ultimately, unexpected events will force them both to let go of their pasts and focus on the future. 'Heartbreaking and real, grounded in a stunning natural environment. McKnight questions our responsibilities - to loved ones, and to places we love. '- Inga Simpson 'A poetic and powerful portrayal of how hard it is for humans to change - even while the world changes around us. 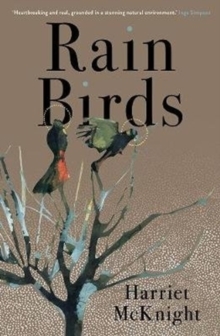 Rain Birds is a moving meditation on the deeply intimate kinds of loss experienced within families, and the harrowing losses our entire planet is facing.' - Ceridwen Dovey 'With a delicate yet decisive hand, Harriet McKnight deftly weaves the stories of two forthright women searching for moments of stillness in an ever-changing world.